Heat oven to 350°F. On ungreased cookie sheet, place dough rounds 2 inches apart. Bake 12 to 15 minutes or until edges are light golden brown. Remove from cookie sheet to cooling rack to cool completely. Meanwhile, to make hats, remove creme from sandwich cookies, and attach miniature peanut butter cup to one half of sandwich cookie, using small amount of vanilla frosting. Continue for remaining hats. Cut marshmallows in half, and place one half on top of each cookie, cut side down. In small microwavable bowl, microwave remaining frosting uncovered on Medium (50%) 20 to 40 seconds, stirring halfway through, until slightly warm. 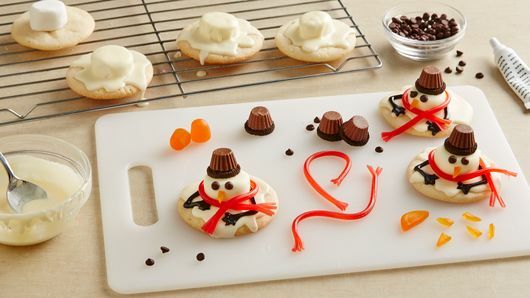 Spoon frosting on top of marshmallow and cookie to look like melting snow; attach hat to top of each cookie. Attach miniature chocolate chips and orange gumdrop candy for eyes and nose. Allow to set 20 minutes. Use black cookie icing to pipe arms on each snowman cookie. Wrap one piece of licorice around neck for scarf. Allow to set completely before serving, about 30 minutes. Place waxed paper or parchment paper under the cooling racks to catch drips and ease cleanup. It’s helpful to work in small batches, so the frosting doesn’t set up before the hats, eyes and nose are attached. 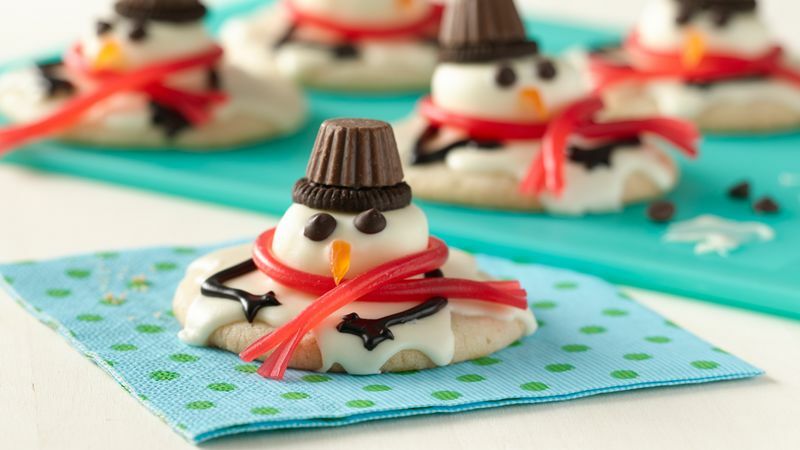 These absolutely adorable melted snowmen cookies are not just impressive pieces for your cookie tray, but they are also a great holiday activity for you and the kiddos. 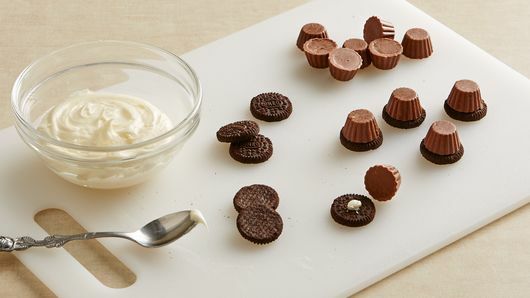 You can assign your little helpers different tasks—placing marshmallows on top of the cookies, decorating with the candies, putting the hats together and pouring the melted frosting on top of the marshmallow-topped cookies. Turn some holiday music on and have fun with it! These cookies are a joy to make with friends and family, but they will make a bit of a mess. To minimize cleanup, put a piece of parchment paper under the cooling rack so that when the frosting is poured over the marshmallow-topped cookies, it catches the excess drip. Also place some parchment paper on the counter for everyone to work over while assembling the snowmen with the candy hats, scarves and faces. (Psst! We have more cookie tips where this came from, including how to store these cookies, what type of cookie sheets to use and more in our comprehensive How to Make Cookies article. Check it out!) Did you have a blast making these holiday cookies? We have a bunch more Christmas characters for you to create next like reindeer cookies, Santa cookies and more. Check them all out in our big cookie collection!